What Makes a Pitcher’s Count? What’s a pitcher’s ultimate goal? In the grand scheme, it’s to help win games. A pitcher needs to do his part to keep runs to a minimum — and strikeouts are the best way to accomplish that. Walking, or hitting a better, can’t help. Those outcomes (plus avoiding home runs) are the three rates, each with somewhat separate skills that most of us watch when evaluating pitchers. And getting ahead in the count is at least partially responsible for all three outcomes. In my first look at pitching ahead to batters I defined a pitcher’s being ahead in the count as having it 0-1, 0-2 or 1-2. Conversely, batters were ahead in 1-0, 2-0, 3-0, 2-1 or 3-1 counts. Those demarcations were made by simply taking the greater number, aside from full counts. The aggregate numbers support the difference between the two types. In my self-identified pitcher’s counts, batters are held to a .204/.211/.303 line this season. Shifting to a hitter’s count, the batting line more than doubles to .342/.472/.609. Clearly a pitcher benefits when he’s ahead, but I wanted to know about home runs, as well, and whether this was a good division of counts. I took the 12 possible counts and ordered them by how often a batted ball in that count became a home run. 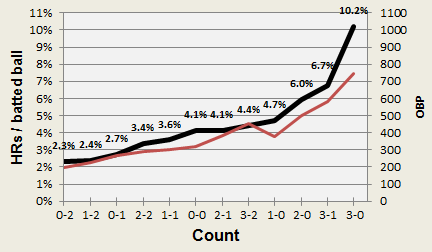 I plotted that alongside the on base percentage (OBP) after reaching that count this season. I used OBP instead of another measurement because I wanted to minimize the effects of home runs in the sorting variable as much as possible. OBP is both easy to find and less susceptible to home runs’ influences than, say, SLG, OPS or wOBA. And if you want to nitpick, yes I had OBP go up to the impossible 1.100 mark. I wanted the vertical axis lines to match up. So, there. Deal with it. It’s not a surprising result since being behind in the count likely would mean that hitters have to protect more. That can inhibit their ability to square up pitches as they have to cover a much larger space. But, still, it’s nice to see an intuitive piece of baseball faith confirmed with data. What I was most interested in is how well the two track when compared to each other. There’s a blip where sorting by OBP would have a 1-0 count be more pitcher-friendly than a full count (for obvious reasons), but on the other 10 places, the two numbers agree on the ordinal ranking of the counts. So, considering the above, should we re-think what a pitcher’s count is? Does 2-2 belong with the more obvious 0-1, 0-2 and 1-2 group? Is 2-1 more of an even count? Do full counts, with their more walks but more strikeouts — and roughly average home run rate — belong in any category? We hoped you liked reading What Makes a Pitcher’s Count? by Matthew Carruth! Effectively Wild Episode 33: The Least Likely Team to Win a World Series In the Next 10 Years/Does it Matter if Jimmy Rollins Jogs? Great question! I’m not sure what a “slightly average home run rate” is, though. Literally slightly average home run rate is slightly closer to average than the furthest outlier. For example, if the average number of children people have is 2, and the most anyone has is 50, then having 24 children is slightly average.